A Photography student at The Sixth Form College, Solihull has been shortlisted for an award for her artwork, which showcased diversity in society. Claudia Pettifer (aged 17, from Yardley Wood) attended the FE Sector Diversity Awards with family and staff from the College. Organised by the National Centre for Diversity, the event was set up to celebrate ‘fairness for all’ in Further Education. 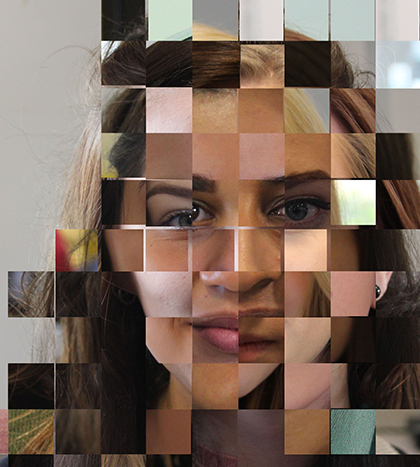 Claudia was shortlisted for the Diversity Arts competition award for her Photography work, which was a montage of all the faces she sees on a regular basis. Claudia was not the only student to do artwork with a diversity theme; 17 A level Photography students completed work with a diversity theme for an internal College competition. All submissions are currently separately judged by a panel of photography experts, to determine a winner and runner up. All submissions will be exhibited as a group of work within the College once they have been judged. In preparation, the Photography students did a research visit to the exhibition ‘East Meets West’, which is currently on at the Birmingham Museum and Art Gallery and they had a week to respond to the live brief for the College competition. Four of the students who went on the visit have also been running an Instagram ‘take over’ for the ‘East meets West’ exhibition. This work supports the College’s strategic priorities and our equality objectives. The College is currently working towards an Investors in Diversity Stage 2 award through the National Centre for Diversity. The College is currently ranked inside the top 25 in the country for equality and diversity, out of more than 100 organisations, as announced at the FE Sector Diversity Awards recently.